Student of Petrozavodsk State University and an amateur astronomer Artem Novichonok discovered a new comet. Novichonok found the object studying pictures made by the automated astronomy station TAU in Kabardino-Balkaria. Finding the comet was confirmed by Britain’s Nick Howes, working with telescopes in Hawaii Foulkes.Additionally observations were carried out by the Americans Gary Hagom and Terrence Brescia. Among other things, scientists have been able to establish that the comet belongs to the class of short-period with circulation period of 10-12 years. From the International Astronomical Union comet received the designation P/2011 R3 (comet Novichonok). Currently the comet can be found at the sky in the constellation Cetus. Celestial body is the 19th star value. For comparison, the faintest stars observed from the earth have a value of not more than 7.7. 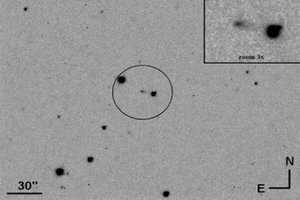 This is the third comet, discovered by Russian scientists last year.